One of the ever-popular posts on our blog includes this simple name plate template that you can download and use to print out name plates for your workshop attendees. 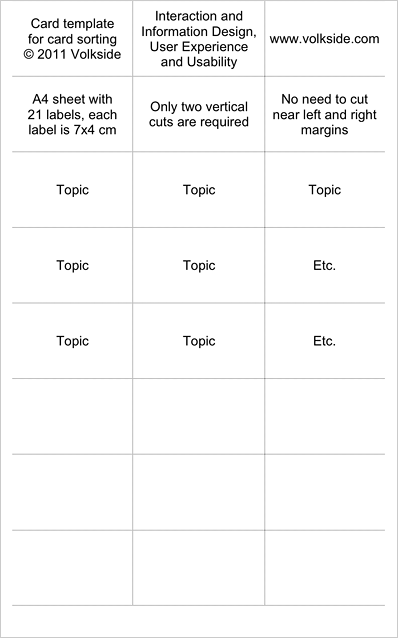 Prepare a list of topics you want to include in your sort, typically no more than 100-150. Paste your topics into the template below. Paste Special > Unformatted Text works best. Print out your cards, in multiple copies if required. Shuffle the cards to randomise them and run your card sorting exercise. Use a digital camera to document the resulting structure. The menu paths above assume Microsoft Word but you should be able to open the template in other applications such as OpenOffice Writer. Download card template as an RTF document (45 KB, paper size A4). You can open and edit it in your favourite word processing application such as Microsoft Word.